I recently got Frantic Stampers Feathers precision die set. Feathers are all the rage right now and I've been thinking of something to do with them. 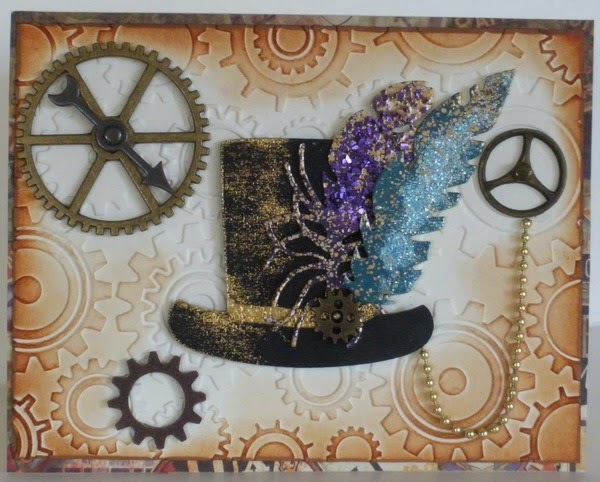 I love top hats and steampunk style so....I decided on this theme for a card! I wanted my feathers to really have some pizazz so I used two sets of Encrusted Jewels by Stampendous. They give you a little kit with embossing powder and other stuff to create some pretty cool effects. I used Teal and Purple sets. 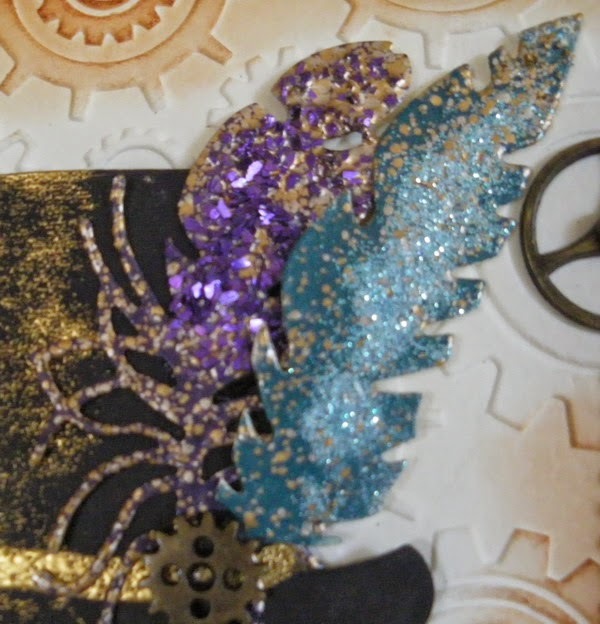 Steampunk is all abut gears so I had to include this in my card too! 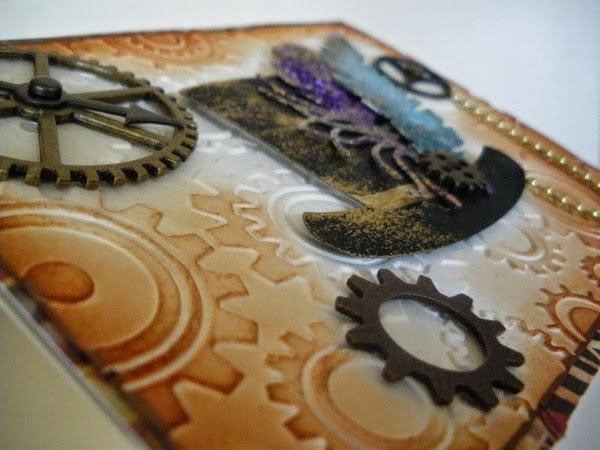 I embossed an ivory piece of cardstock and added an edging of copper and then Rusty hinge and Tea Dye over top of it. I added some gears of course, even a little gear at the base of my feathers...so cute! and then...my focal...a top hat with feathers! I mounted my hat with mounting tape so it could really stand out. 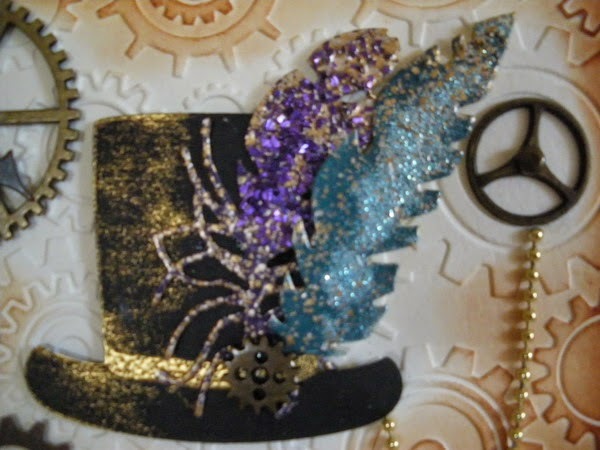 I love the way the top hat and feathers turned out. I cut a small slit in my hat so that I could thread the stem of each feather into it and attach from behind the hat. 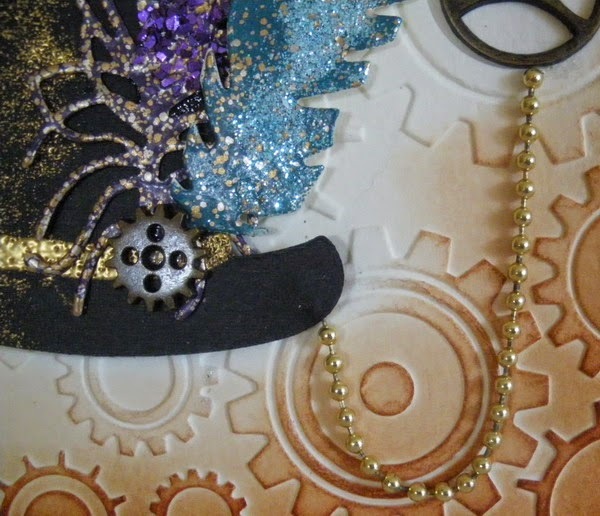 I added some gold embossing powder touches like a brim and some "wear". I hope you enjoyed my card today! Thanks for stopping by! The Sunburst Panel die from Frantic Stamper makes a wonderful background stamp. 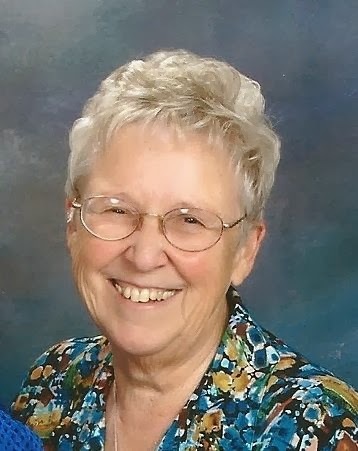 Rozy shared it as a background on her fabulous Easter series of four cards in her "Hoppy Easter Card Set" post. And Sharon shared it as a background as well in her "Pretty In Pink" post. I thought I would showcase the die as the focal point of the card instead of as just a background. All I did was use the die to cut the sunburst out of an orange-yellow card stock. I glued the sunburst to a panel of lighter yellow card stock and attached that to a white card. I stamped the saying (from Hero Arts) onto a scrap strip of white card stock, and notched a flag end on the left side before attaching it to the card with foam dots. This card took literally just a minute to make, but I think it is a wonderful card to send to someone to cheer them up. Wouldn't you agree? Good morning all! It was the third of April while I was making this card, and here in Michigan we were having a mix of sleet and snow. Will it ever stop? It seemed almost as if Spring will never happen. Just like the card...it almost didn't happen. I had a wonderful project in mind but when I sat down to make it, I couldn't find my journal with the specifics of what I wanted to do. I knew I wanted to use this image and already had it colored. I spent so much time looking for the journal that I finally gave up and "let the chips fall where they may." 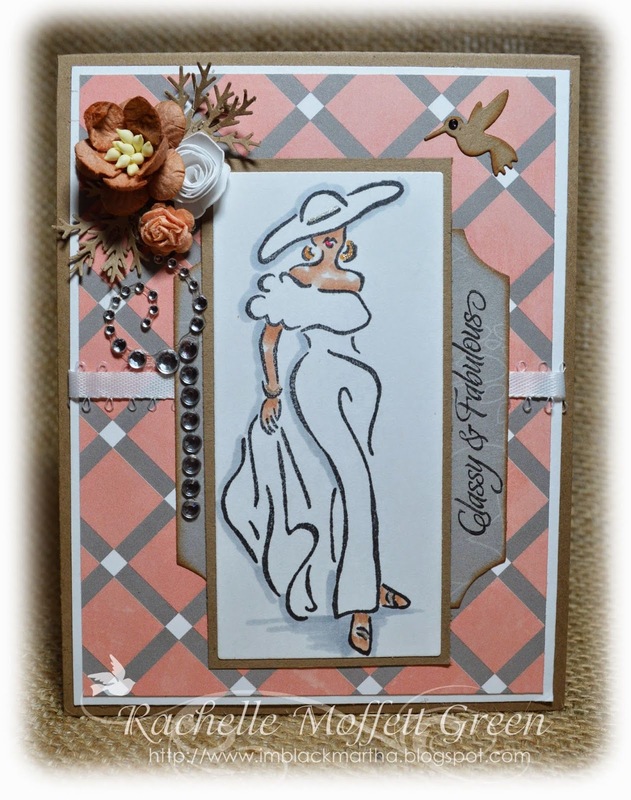 I wanted the card to be as elegant as the image, after all what is more elegant than a "Strutting Lady?" Once I chose the BoBunny paper and Coved Labels, everything started to fall into place. 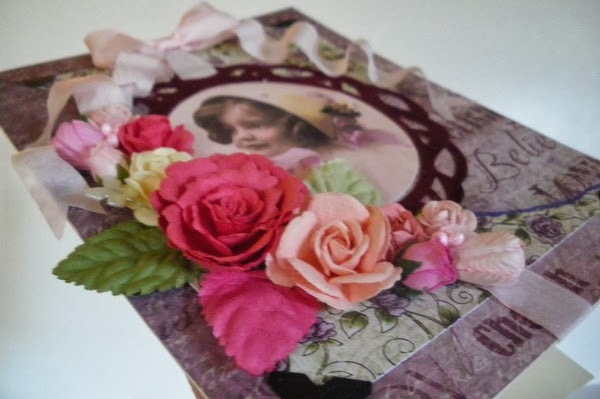 I used Tim Holtz Distress ink on the edges of the label to give it a vintage look. Not wanting total symmetry, I placed the label and the image slight off-center. I added the flowers and bling because a Strutting Lady deserves them. Finally I added the small bird accenting hime with a small piece of bling for the eye and inked the edges for a subtle yet delicate look. I can't say enough about Frantic Stamper dies. They are absolutely the best dies I've ever used and I'm not saying that just because I'm on the design team...I'm say it because it's true. I've never had a miss-cut nor do I have to add additional shims or run it through my die cutter numerous time. They work the first time and every time. Look at the tiny bird. Notice the beak? It's perfect. If you haven't tried Frantic Stamper dies you are missing out. Materials for this card are available at Frantic Stamper.com. I know. I know. It is spring, and almost Easter, and you don't want to see any more snow. BUT I am making Christmas cards throughout the year and sharing them each month, somewhere around the 25th (I know I am a week early, but just wait...there is a great reason!). This month I used a fabulous new die (if I do say so myself, since I designed the die!) from Frantic Stamper to create a quick and easy card, and I just had to share it today. The reason for having to share it now, you ask? Why, because the die I used to make it is being released today! First let me share how I made this card, then I will tell you a lot more about this release. I prepared a standard card base, then to that I affixed a 3.75"x5" panel of navy blue card stock to which I had glued two white pieces cut to make snowy hills. 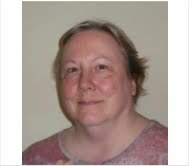 I traced the top edge of those hills with a bit of clear Wink of Stella to give them some glittery sheen. I then cut a piece of craft foam with the new Moose in the Forest die (FRA-Die-09161) from Frantic Stamper, and cut an identical one from white card stock. I glued the two of them together, and then glued them to my card over my navy panel. I added a few tiny snow flakes and a bow, and the card was done. So why is a moose in the forest being released today? Because this moose is versatile! We think he is PERFECT for masculine cards, and Father's Day is just around the corner! 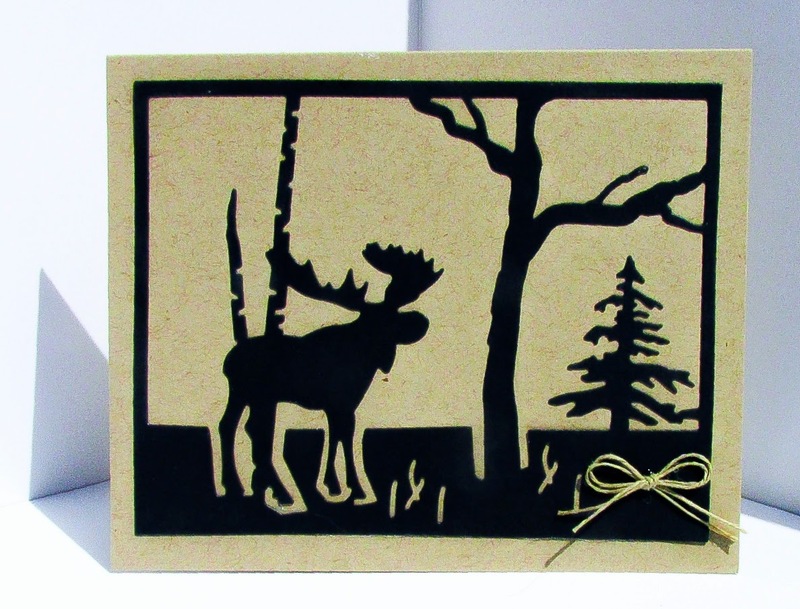 Here is an example of another use for this moose; a card made by cutting the die out of black card stock and gluing it to a Kraft card. A little bit of jute twine for a bow finishes the card off; a masculine card in mere minutes! We think you would LOVE this die! I know I sure do! So much so that the Christmoose card is going to be one I make a lot of for this year's holiday season. We realize, though, that Mother's Day is also on the way, so we just had to include some dies for Mom, too. Here are some lovely butterflies that she is sure to love. to go with a lovely rose. but what back yard would be complete without a swing set? This month's release also features some nifty journaling cards for you to use to scrapbook all about your family. And there are some more terrific "full-panel" dies (besides the moose and bear) for your scrapbook pages or cards. And to go with that Chevron full-panel there are some accent pieces and border/edger dies. Be sure to hop on over to www.frantic stamper.com to place your order now! Die cut the Southwest Panel in silver foil, copper foil, teal foil and red foil paper. Form the cross using Copper Foil, insert inlays. Fill other openings with teal, silver & red placement of your choice. Layer completed panel on Teal cardstock base. Apply finished framed work to the front of Flip Book mini album. 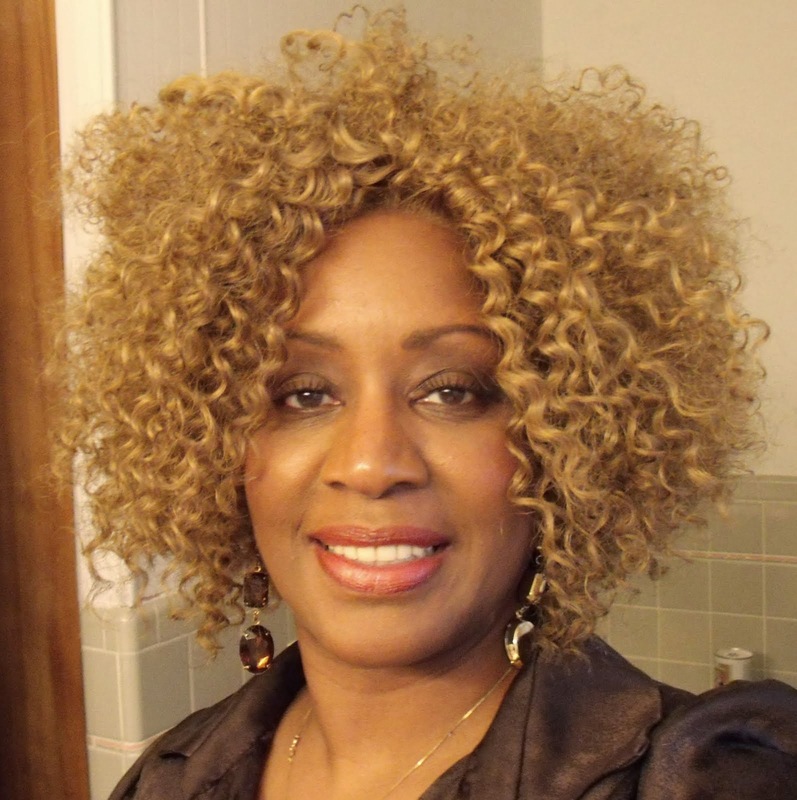 Embellish as desired. Decorate the inside pages to go with the theme of your choice. The Southwest Panel is one of the most versatile to work with. Give it a try, you will be amazed at what appears as you study the pattern. 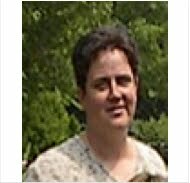 I have a friend who likes to celebrate her birthday with a lot of gusto (I am just the opposite; my birthday is pretty much just another day to me). This card is inspired by one of her celebrations, which had plenty of music, streamers, and friends sipping appletinis while sharing stories of our best times with her. The record on the front of the card is a Phenakistoscope mechanism; it spins when you pull the little record tab! Here is a link on how to make a phenakistoscope, in case you missed it before. This one was made in the same way, but on a smaller scale. Those of you who are old enough will remember the little yellow adapters which allowed 45RPM records to be played on a regular turn table. I made mine with a punched circle and tab-shaped slot and eighth-inch circle hand-held punches. The party is really festive with its banner decoration, made using a piece of twine and five colorful fish-tail flags cut with a Frantic Stamper die. Making the banner even more festive, though, are a few streamers created with quilling papers and a quilling tool (which are BRAND NEW products available at Frantic Stamper!). Aren't they fun? The music is really going for this party, not just in the record, but in the embossed background, and the musical score emanating from the record...and carrying over to the inside of the card. Finishing off the card is perhaps tipsy Martini Riley on a record of his own, mounted to the card with a wobble spring. I hope you've enjoyed my little card party. I surely enjoyed the real one that inspired it! ***Materials for this project are available at www.franticstamper.com. I love to use old pictures in my artwork. I came across this picture of a little girl in a bonnet and it reminded me of when I was a little girl at Easter. Mom always got us a new dress to wear when we visited grandma on Easter Sunday. 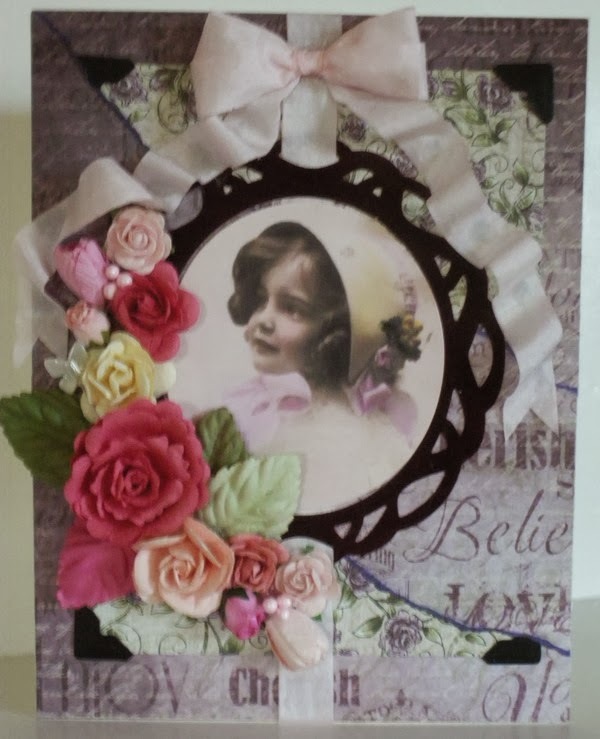 I used the Heartfelt Creations Paper Pad for my background paper on an ivory card base. I also used Prima flowers. They have these packets of flowers in different sizes and leaves too! it made it very easy to create my bouquet. I did use some additional flowers and pieces but not much! I cut out the frame in burgundy suede paper and used the same Frantic Stamper die to cut out my picture. I like using photo corners because they lend themselves to that old fashioned feeling. I added a white pearl butterfly pin as a last touch (did you spot it?). Have fun creating your own Easter cards this year! *Materials for this project available at www.franticstamper.com.